Anyone looking for something a bit out of the ordinary on the weekend of 30/31 March 1930 got a bit of a treat at Porth Nanven. Washed ashore on Saturday 30th was the British World War One submarine L1. 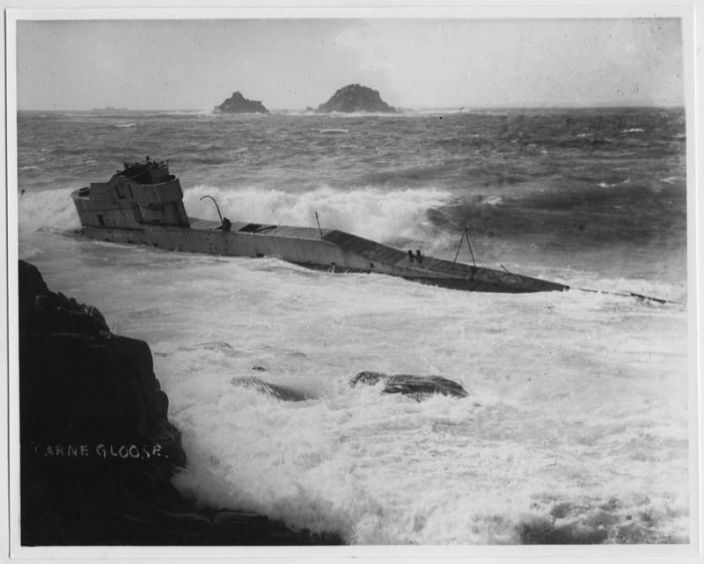 The Cornishman reported that the vessel was well embedded in the sand at one end while the other was “piled upon the rocks”. According to the Cornishman the sub was spotted well aground at 7.45am by Mr James Chapple of Cot Valley but people in the cove at 6am the same morning seemingly saw nothing at all. L1 had been under tow from Chatham on her way to be broken up at Cashmore's ship breaking yard in Newport. The sea around Cape Cornwall had been rough overnight on Friday/Saturday and tow broke. 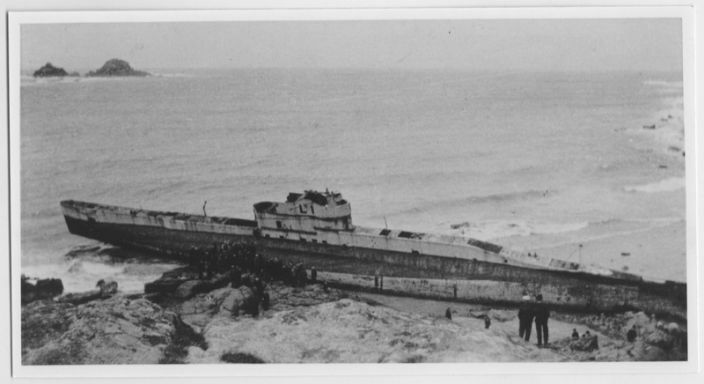 The tug, Eastleigh, made her way to St Ives while the submarine was washed ashore and clearly driven into the rocks as photographs show. L1 lay on the beach at Porth Nanven for some time until a team from Cashmores broke her up where she lay. The submarine was built by Vickers at Barrow-in-Furness where she was laid down on 18 May1916. She was commissioned on 18 November 1917 and joined the 6th flotilla at Portsmouth under her first skipper Lt. Cdr. R.B. Darke. The first three years of her career were spent in home waters but in 1920 she sailed for Hong Kong where she remained until at least 1923. “L1 Submarine,” Morrab Library Photographic Archive, accessed March 7, 2017, http://photoarchive.morrablibrary.org.uk/items/show/13694. “L1 Submarine,” Morrab Library Photographic Archive, accessed March 7, 2017, http://photoarchive.morrablibrary.org.uk/items/show/13097.